Only about ten years ago the word icon would automatically bring to my mind, with my Protestant roots, an ancient picture on which an event or person from a distant past is portrayed. It evoked associations with dusky, candlelit vaults, churches smelling of old timber and antique interiors. All very respectable, but from a different time and tradition from mine. In the meantime I have come to a better understanding of the function of an icon, as it is experienced by many. An icon can help people become aware of the presence of the Holy and the Holy One, not only in another time and place, but also in this time and in this place, in the here and now. As a mirror image of the name of God: I am who I am, I am with you. In this meditation I would like to share with you how I have experienced looking at this contemporary icon. This icon is dedicated to the holy martyrs of Libya, who have been declared saints by the Coptic Orthodox Church. They are the 21 Coptic Christians who were beheaded by ISIS on the beach of Libya in February 2015 (see http://time.com/3710610/libya-coptic-christians-isis-egypt/). Before their death they had been held captive for forty days; they maintained their faith without denying Christ. What we see on the icon is the climax of those forty days, the end of their suffering. Few would ever be able to forget the picture of the rows of men dressed in orange overalls, kneeling by the water’s edge, behind each of them a black-masked ISIS executioner. The composition of the icon brings to mind a table with Jesus at the head and the martyrs around it. The ISIS executioners stand behind the martyrs, like footmen, or waiters, with their knives at the ready. Words from Psalm 23 come to mind: You prepare a table before me, in the presence of my enemies. Most of the martyrs are looking towards Jesus. Just as Stephen saw Jesus moments before his death, these men, also on the threshold of death, see him present already in his glory. Stephen, full of the Holy Spirit, looked up to heaven and saw the glory of God, and Jesus standing at the right hand of God. The executioners have no face; they are dehumanized. Their devotion to ISIS has stripped them of their personality, of the unique beauty that each of them received from the heavenly Father at the time of their birth. Pity for these spiritually mutilated creatures trickles into my consciousness. Completely against my human feelings of abhorrence I hear the compassion of Jesus: Pray for those who persecute you; Father, forgive them, for they do not know what they are doing…. Blood is streaming from the knees of the martyrs to the waves that surround the scene. ISIS boasted that the blood of these martyrs would wash ashore in Rome, in Europe. Blood on the waves. Perhaps it is the blood of Christ that surrounds them here? This icon encourages and consoles me. It confirms the presence of Christ in the suffering and death of his brothers and sisters. Just as he awaited Stephen with open arms soon after his ascension, just as he was present with the living torches in the garden of Emperor Nero and the stakes of the Spanish Inquisition and the martyrs of Kyoto in the 17th century, he waited for these men on the beach in Libya in February 2015. In the same way he is present today at the atrocities of the prison camps in North Korea. We may know that he will be present in every possible current and future suffering of his beloved. 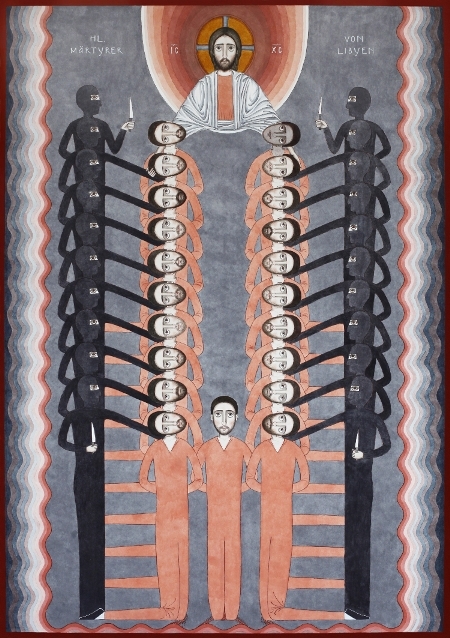 Nikola Saric: Icon of the Holy Martyrs of Libya, 2015, 100 x 70 cm, watercolour on paper. This icon was first exhibited in the Coptic Orthodox Brenkhausen Cloister in Höxter, Germany. The intention is to sell the icon to support the families of the martyrs with the proceeds. Leave a message if you are interested. In addition, there is a limited edition of prints of the icon for sale. To order a copy, click here. Nikola Saric grew up in Bajina Bašta, Serbia and studied in Belgrade at the Techno-Art School. In 2005 he changed to the Faculty for Restauration and Conservation of the University of Belgrade. After that he studied at the Academy of the Serbian Church for Art and Conservation, where he graduated in 2014. Since 2011 he has been living in Hannover, Germany. In 2016 the book Zeugen (Witnesses) was published with pictures by Nikola Saric and poems by Nikola Ðolović (ISBN 978-3-9817939-0-1). For an English interview with Nikola Sarić, click here. Wilma Wagenaar is an artist concerned with the dialogue between church and art. For ten years she has been organising retreats for painters in Benedictine Abbeys. She is a council member of the Stichting Platform Kerk en Kunst (Platform for Church and Art).